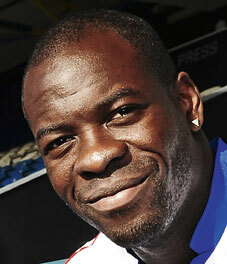 Christopher Samba: When I was at Blackburn I was told they were going to rebuild the team, and when they didn’t I felt my time was up. I needed a new challenge. I’d gone to Anzhi, I’d gone to a fantastic club and I’ve really no regrets about that. I came back to England for personal reasons. I still think Anzhi can be one of the biggest clubs in the world and I’m sure they will be with an owner who is investing so much in the team. They have just signed Willian, so you know you have to be crazy to leave a team like this. But with me it was just a question of wanting to be back with my boys. I have two youngsters and I want to have a great life with them. So that’s why I decided to come back to Europe. All the money in the world cannot make you the happiest man. People who are born into money are often not happy in that life. If you can enjoy your football and have your loved ones close that’s all you want. For me, family is the most important thing. When I was at Blackburn I took a whole box for them and there could be anything up to 30 in there. That’s who I am. That’s how it should be. So, no regrets about choosing Anzhi? No, this club do everything to make life good. They really take care of you and you want for nothing. They are a fantastic club. It was just a case that I was alone all the time. It was hard. For a year you are alone at home, just watching TV or something. I didn’t think that was the life for me. I’d say you have to go to Anzhi. Is there much difference between the Russian Premier League and the English top flight? Oh yeah, it’s a massive, massive change. The build-up is slower in Russia, while in England it’s direct and about pace. It’s really much more difficult for a defender in the English Premier League. It’s a really aggressive tempo, that’s why it’s the hardest league in the world to play in. Were you surprised that QPR were willing to pay so much money to bring you back? Well, I don’t know how you judge if it’s too much money. Some people do, but I don’t know who is worth what. Is £12million too much? I don’t know. Or if it was another player would it be OK? Maybe someone else is worth more. Maybe some people believe that what I have done in football, my reputation, what I did at Blackburn, was enough to pay this. I’m not there to judge it, I didn’t set the price. I’ve been bought for a reason because QPR believe I can make a difference. I certainly believed that I could lead the team. I don’t know if it will be enough, but one thing is sure: I’m going to do my best to help them. Is there extra pressure with such a price tag? not enough, but I never go on the pitch thinking I’ll just go through the game. That’s not me. You should try to do your best every game. Are there similarities between QPR and Blackburn’s relegation troubles? How did the QPR move come about? I spoke with Harry [Redknapp]. He had tried to sign me before. That didn’t happen, but I know that he had wanted me to work with him for a long time. Obviously we’re not in the best position [in the league]. We have had to rush things a bit in the way we work together. We didn’t have much time but we have tried to be effective very quickly. Yes, Tony showed great belief in me and I will try to pay him back. At Anzhi I had three years left there on a big salary. Obviously, if I come back to QPR it’s not to make more money. Not at all. All the talk about money is just nonsense, really nonsense. What we are going to try to do is fight to the end. I’m sure now we’ve got a good bond and we are working hard to win our survival fight. Can you fix the problems at QPR? There’s a lot to improve but we need to think more as a unit and have more understanding in defence. We had won something like twice in 25 games when I arrived – but it has to be all about winning now.